Mark Americo Wentz was born on December 31st, 1977, in Kent, Ohio. 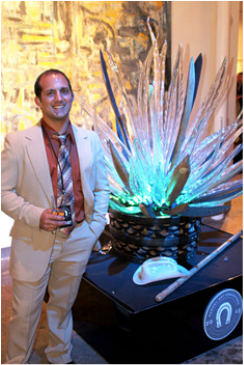 He earned his BFA in Glass from Kent State University in 2002 and his MFA in Sculpture from Savannah College of Art and Design Atlanta in 2013. Coming from a construction family, Mark was exposed to a wide variety of skills and craftsmanship. Mark’s passion for competition led him to become a Division I college athlete; this competitiveness inspires much of his work. He attempts to create the ephemeral nature of victory in his work and give the viewer the chance to relate and feel the rush that is presented. He is fascinated with the idea of the trophy and what draws people to sacrifice their lives and bodies to obtain them. By making most of his work to appear to look like modern versions of an artifact, he expresses his historical interests and life story. Having the opportunity to travel across the country and work with several artists of different media has greatly influenced Mark’s ability to use a variety of materials. He uses traditional techniques and incorporates several media: predominantly wood, steel, concrete, and glass. He has built a traveling glass studio to educate and entertain the public. Mark approaches his work methodically, but ultimately works intuitively, which relates directly to the process of competition.